The birthing bed suitable for labor, delivery, recovery and postpartum. Perfectly suitable for labor, delivery, recovery and postpartum, the revolutionary design of the AVE 2 brings a new level of comfort and efficiency to every phase of childbirth. The AVE 2 has many features that make the birthing process easier for both the mother and the medical staff. Thanks to its broad range of accessories and positions, the patient has the ability to choose a delivery method that best suits her birthing plan. A simple revolving mechanism allows the footrest to be retracted under the bed for faster and easier delivery allowing the medical personnel better access to the patient. The unique oval shape of the supporting area is especially suitable for smooth delivery and provides ample working space for the obstetrician. The innovative telescopic bed structure offers a broad range of height adjustments, while side handles with intuitive control panel can be easily turned and retracted if necessary. Moreover, the high standard of hygiene and compact construction of the supporting area with plastic cover reduces the time required to clean the bed. A simple one-handed swivel mechanism not only allows the section to quickly rotate away from the patient, but it also eliminates the need of lifting a heavy foot section off of the bed. The swivel foot section also enhances caregiver safety and infection control due to the fact that it never detaches from the bed. 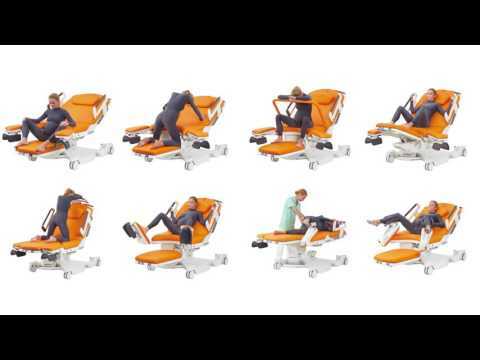 The innovative seat sections allows for quick configuration and new positioning options for caregivers and patients. Siderails have integrated controls for both patient and caregiver that easily rotate down for patient transfer or access. Integrated control panel with clear graphics allow for simple operation by patient and caregiver. Lockout of specific functions improves safety. Innovative column design allows for both a low height for patient egress and greater height for improved caregiver access during procedures. The AVE 2 was developed with clean-ability in mind. The compact column construction and the smooth seamless cover of the bed allow for quicker and more efficient cleaning. The mattress design makes removal easy and efficient for the staff. In conjunction with the design, the bed is coated in epoxy powder coated paint which is durable and resistant to corrosion. Integrated easy-to-use leg rests allow the care team to quickly maneuver and adjust based on the patient’s needs. The leg rests double as both foot rests and leg rests. These features allow for maximum patient comfort while allowing the caregiver full access.